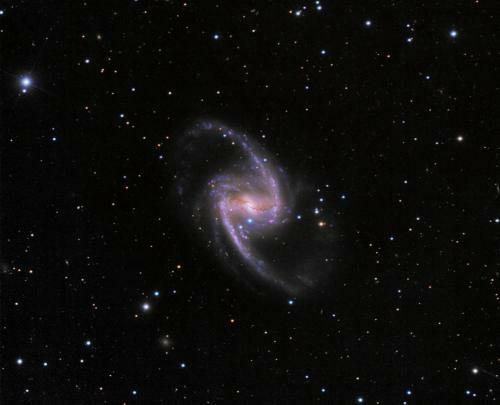 A new supernova was discovered in a nearby galaxy in October of 2012, and it’s recently been identified as a type Ia supernova. Astronomers and astrophysicists are interested in the type of supernova because there are several ways a supernova can occur, and they are categorized by type. The first categorization of supernova is into type I or II. This depends on whether we detect hydrogen in the explosion, as measured by the emission lines. If we don’t detect hydrogen, it is type I, and if we detect hydrogen, it’s type II. These are then categorized into smaller subgroups. For type I, if we detect silicon then it is type Ia. Otherwise we look for a helium line, and if we detect one, it’s type Ib, and if not, type Ic. The type II supernova are categorized based upon the overall spectrum of light as well as how the brightness of the supernova decays over time. You’ll often see a lot of discussion about type Ia supernovae like this recent one. The reason for this is that this particular type of supernova has a standard maximum brightness, and its brightness dies off in a distinctive way. You can see this in the figure below. Because of this distinct brightness and pattern, we can use type Ia supernova as “standard candles.” That is, we can observe their apparent brightness and compare it to the absolute brightness of type Ia supernova. 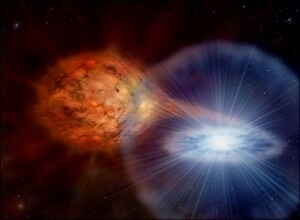 By comparing the two, we know how far away the supernova is. 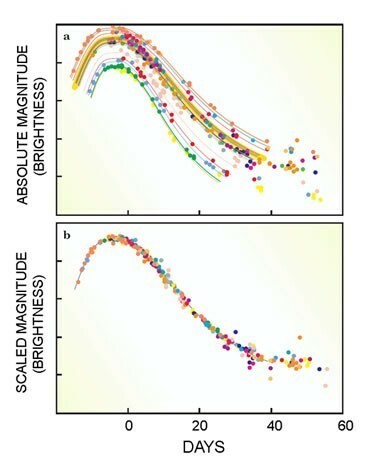 This lets us determine the distance of galaxies. It is the measurement of type Ia supernova that lets us compare galactic distance to redshift, which tells us the universe is not only expanding but accelerating. Relatively close supernovae like this latest one are useful because they allow us to take precise measurements of both the light spectrum and the brightness over time, which helps us better calibrate the measurements of more distant galaxies.